The hugely popular Big Debate show honed in on the issue of corruption this week. The wide-ranging episode tackled corruption in both the state and corporate spheres, referencing various corruption scandals from recent years. It also discussed pre-democracy era corruption and historic collusion between the former apartheid regime and the post – 94 democratic government, which, it was alleged, has perpetuated the dominance of apartheid-style economic power and retarded broad economic transformation. Corruption also poses a moral challenge – Martin Kingston emphasised that unethical practices can often be legal despite being morally questionable. According to the Global Economic Crime Survey, South Africa is a world leader in money laundering, a ranking that prompted debate around tax avoidance and offshore haven use by corporates, and the measures that could be employed to retain such assets within the country as well as to return unpaid revenues that are owed to the fiscus. The manipulation of the rand/dollar exchange rate by banks and the inadequate regulation of the financial sector in this regard were also interrogated. To what extent do public institutions act against the public interest? Will corrupt politicians and businesspeople ever be brought to book? When, if ever, will the monies looted from the public purse and stolen from citizens during various corruption debacles, such as those surrounding VBS, Steinhoff and BOSASA, be paid back? These were just some of the questions raised by the live studio audience. Amabhungane investigative journalist Micah Reddy contended that the focus should be on managing corruption, since those who seek to abuse the system for personal gain will inevitably find ways to do so. Activist Dale McKinley noted that secrecy in both the public and private sectors enables corruption and impedes democracy, thus South Africans must demand access to information in order to protect our young democracy. A multiple-platform electronic poll before and during the television broadcast, showcased widespread pessimism among the show’s followers. 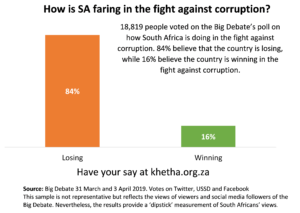 Poll results confirmed that the majority (84%) feel that the country is losing the fight against corruption. Facebook voters were the most despondent, with 92% signifying that South Africa is failing in this sphere, while 89% of Twitter followers and 69% of those who used the free USSD SMS line also deemed that the country is losing the corruption battle. The town hall-style show turned to the question of how corruption should be managed, and the trust of citizens regained? There was some consensus on the need to eliminate the pervasive culture of impunity across the public and private spheres, by strengthening law enforcement agencies, conducting lifestyle audits, encouraging whistleblowing and protecting whistle-blowers. Other suggestions included enacting legislation to reduce illicit financial flows and monitoring labour practices, e.g. in instances where corporates who routinely underpay workers enjoy huge profits with the collusion of corrupt politicians. As Micah Reddy succinctly declared, “no amount of thumamina’ring will fix this” gargantuan problem. Ultimately it is not political rhetoric but concerted action against corruption by citizens, the state and the corporate sector that will effect change. This press release was produced by the Social Surveys Institute in partnership with the Big Debate, with support from the Open Society Foundation of South Africa. The Big Debate poll was conducted by Grassroots, Social Surveys Institute and OpenUp. Khetha! is funded by Open Society Foundation.